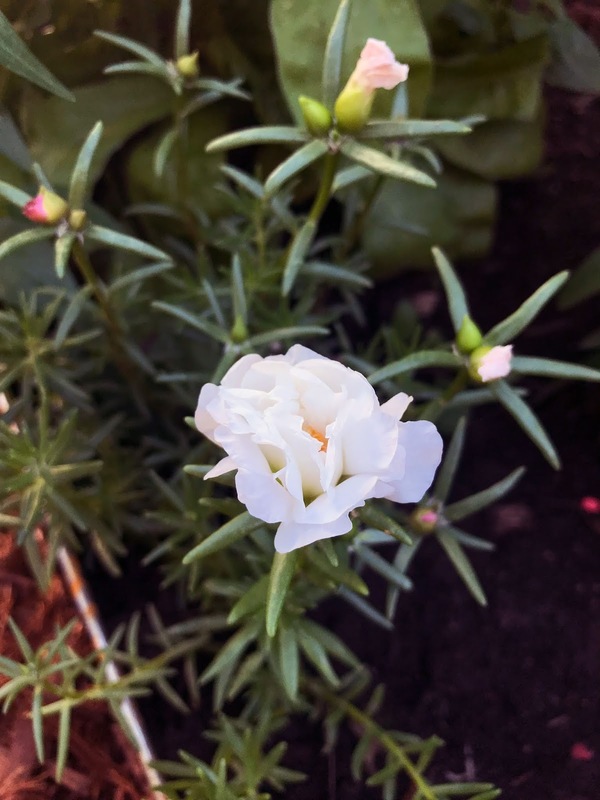 Last week I wrote about my garden and how it's grown over the years. One thing I didn't talk about was cost. Gardening can be expensive and starting a garden from scratch can be daunting when you don't have much of a budget. 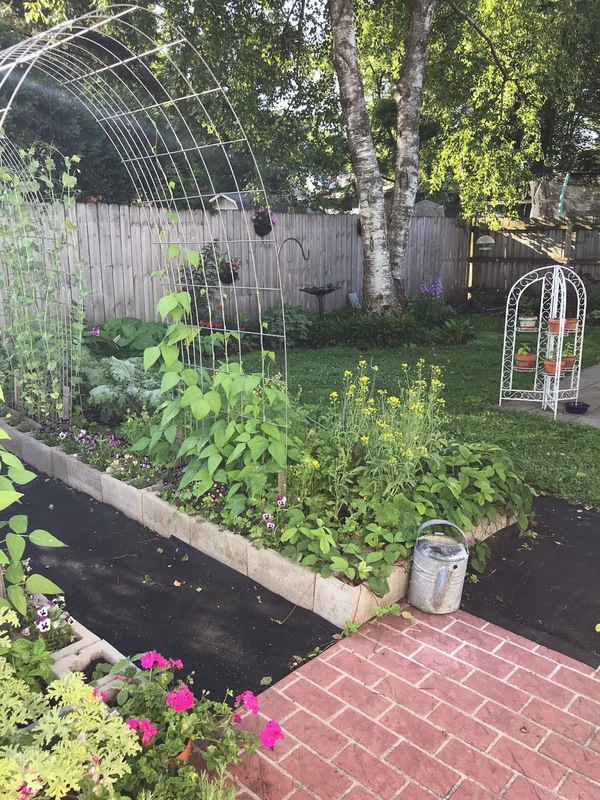 If I'd had more money to pour into it, I probably would have done things differently (and had more roses) and my garden would probably have progressed faster than it has. 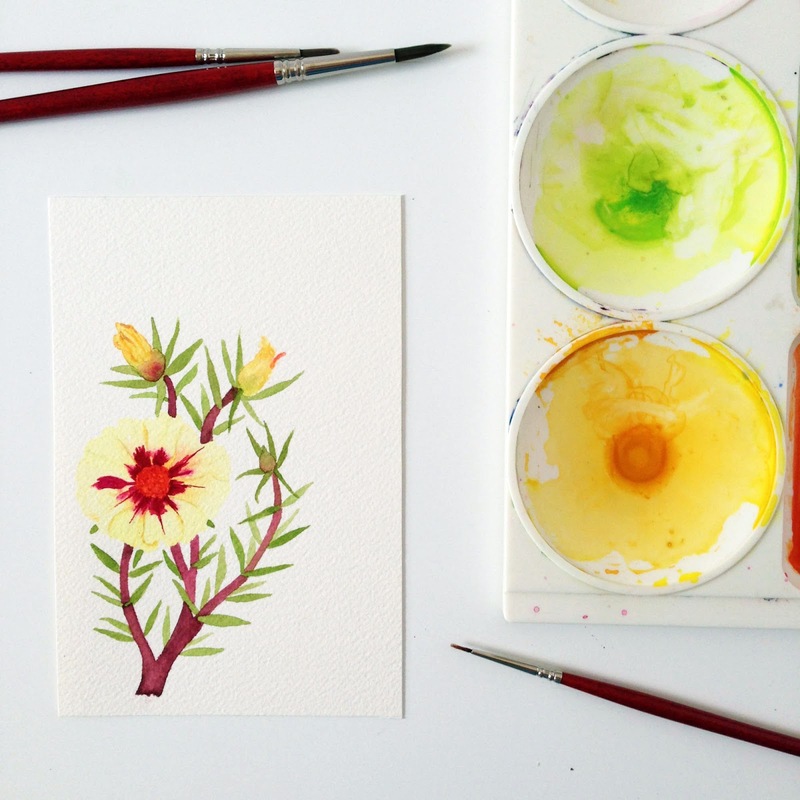 But I think having a small budget can make you more creative. I always have my eyes open things I can reuse or repurpose in the garden. Last year I found a bunch of large pots someone was throwing away just when I was looking to buy some. I've found bird baths, plant stands, scrap wood, discarded plants and many other things that have made their way into my garden. The rubber mats, salvaged by my parents' neighbors were free and work perfectly as garden pathways, even if they aren't so pretty. My hog panel arches were an inexpensive way to add height and interest to my garden beds and so much cheaper than any pre-made garden arch. 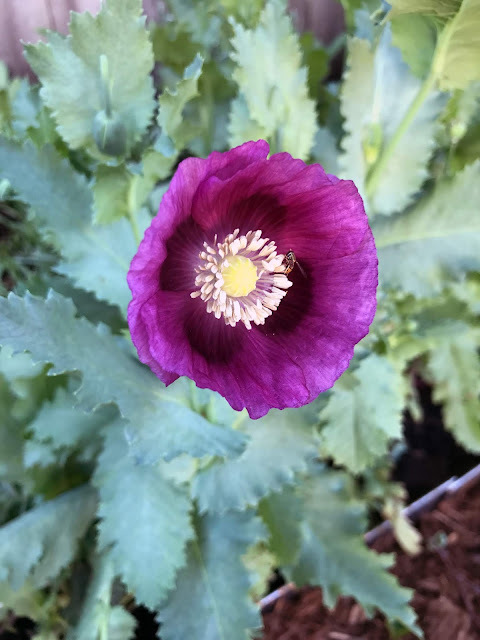 Once I began growing things in my garden, I had lots of free plants, too. Some plants are perennial. They come back year after year. Others die with the coming of winter and don't come back in the spring. 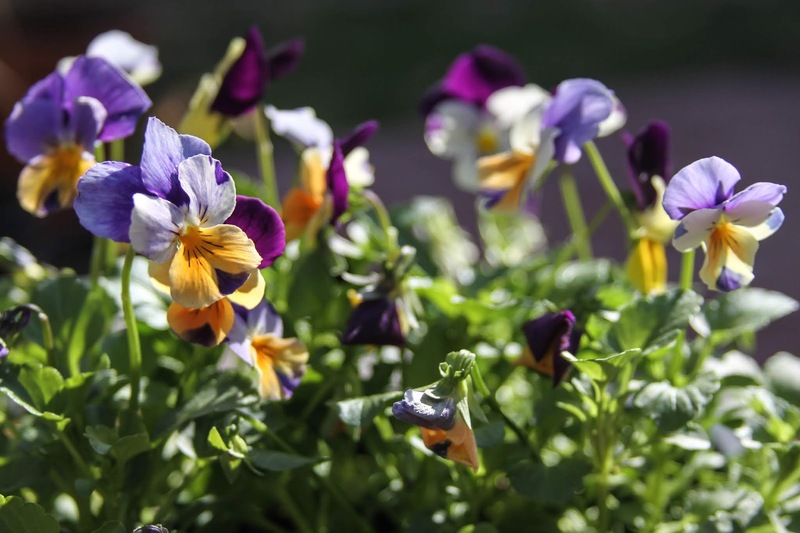 Many plants, both perennials and annuals, gift us with baby plants that grow from their seeds. This spring and summer I've been spending lots of time transplanting self-seeded babies to fill in holes and spread the wealth. It's so satisfying. 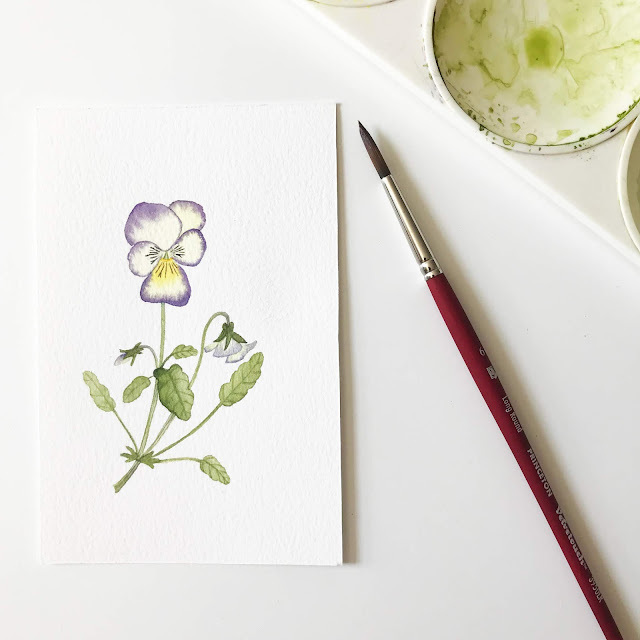 One of my favorite plants is the viola (I can never resist painting them). Violas are also one of the most prolific self-seeders in my garden. I love how many different color variations appear. Each one a surprise and delight. By moving the babies to many spots throughout the garden I hope to have them keep on coming in those areas year after year. 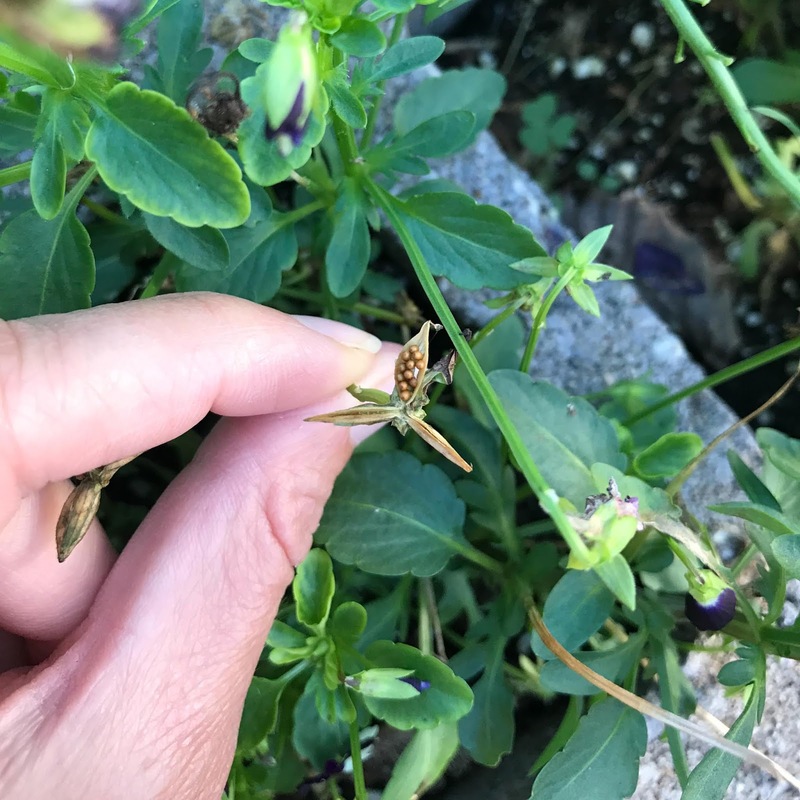 To help with this I also distribute the seeds when I find an open pod on a plant. I do this with other self-seeders, too. 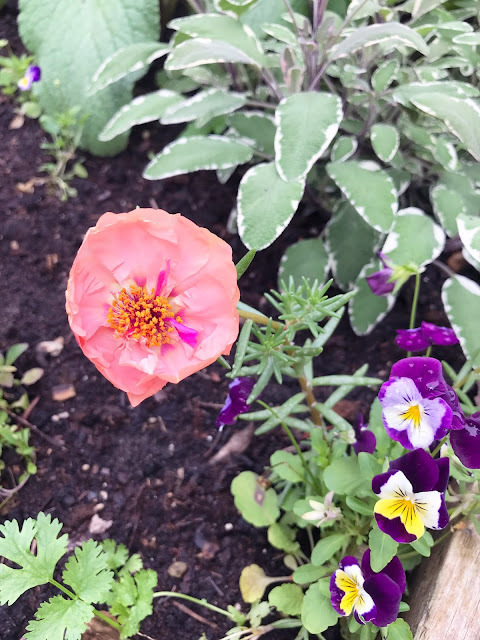 One of them is portulaca, also known as moss rose or sun rose. This year I have so many babies in such surprising colors. 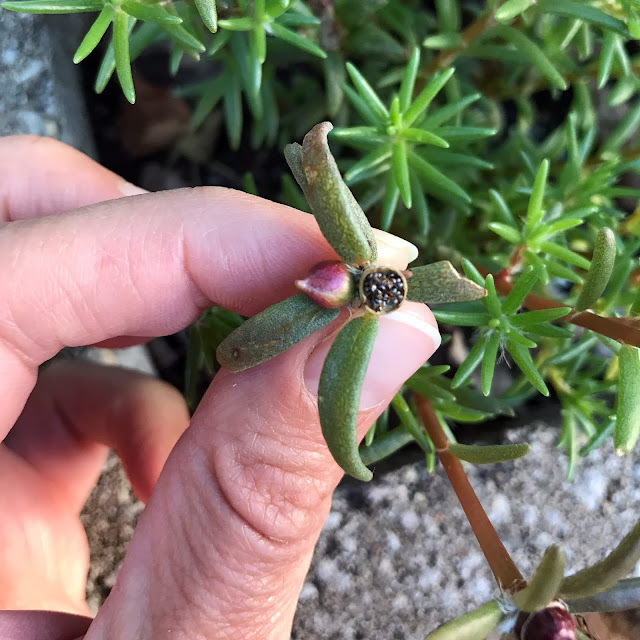 The tiny seeds form in the coolest little pods, too. Sprinkling them around helps to make sure I'll have plenty of baby plants. I plan to paint more of these this year, too. 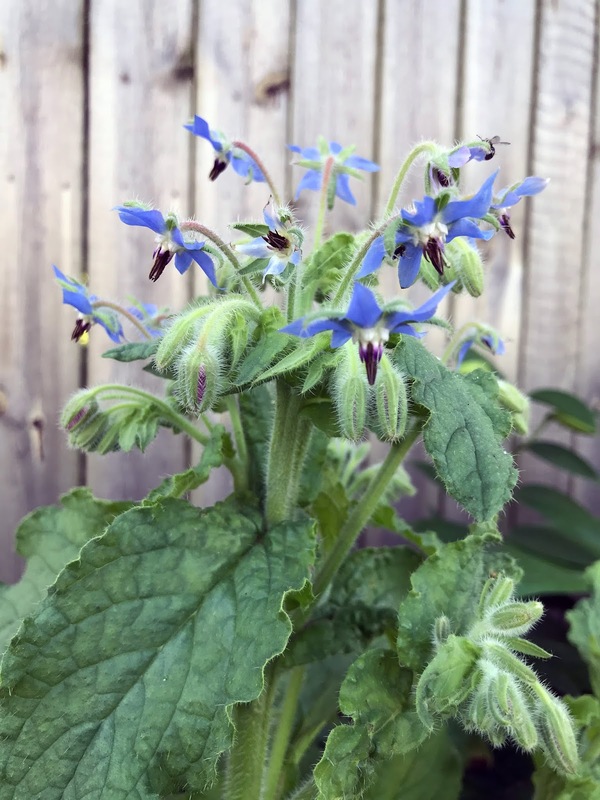 I've only planted borage once and although it's an annual, I'm never without it in my garden because its seeds continue year after year. Marigolds, snap dragons, bachelor buttons, foxgloves, cilantro, amaranth, dill, black eyed susan, verbena, anemones, sunflowers, rose campion, poppies... the list can go on and on. Spreading the seeds in open spots in the soil help to make sure these plants will proliferate and transplanting babies where you want them to be gives you a chance to fill in holes and spread the wealth. Because so many things self seed and sometimes it's hard to identify seedlings when they're very small, I usually don't pull out "weeds" until I'm sure they're truly weeds. Of course, the flip side is that when a plant produces thousands of seeds you probably won't need or want as many plants as those seeds will produce. I always feel a bit bad pulling them out, but there isn't room for everything. And sharing with friends and family is one of the joys of gardening. Not every plant that sets seeds will automatically mean more plants in the garden. I've found that my climate isn't right for self-seeded nasturtiums. Instead I can collect the seeds and plant them the next year (at the right time and the correct depth). Other plants, those that have been heavily hybridized, will not grow "true", meaning the baby plants will be different than their parents. 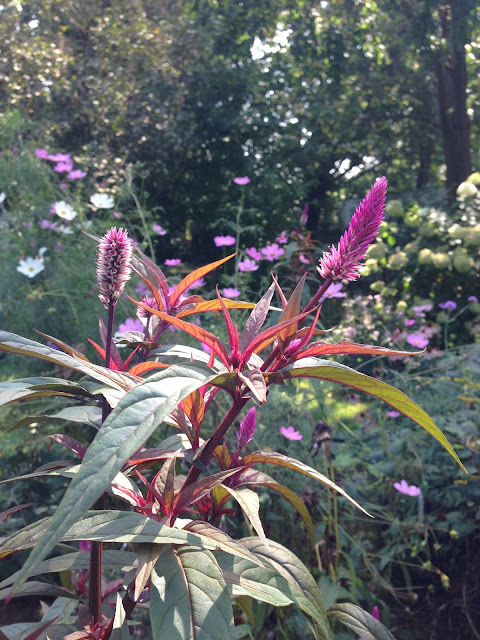 In my garden in Cleveland I grew some celosia one year and the babies that appeared the next year were about three times as tall and much more "wild" than their parents. It's one of the things I love most about gardening... unexpected surprises. What self-seeding plants do you like to grow? I have just discovered your lovely blog. What a wonderful place to visit. I signed up for your Joy newsletter. Wondering when you speak of Cleveland if it is in Ohio - I live about 80 miles south in rural Carroll Co. and paint as well. Will be back soon. Hope you have a beautiful weekend. Hi, Debbie, thank you for stopping by. Lovely to have you here. I lived in Cleveland Heights, Ohio for almost 15 years. I went to college at Wittenberg in Springfield, Ohio where I met my husband and we moved to the Cleveland area after I graduated. My college roommate was from Wooster and I'd often visit her family there. I think that's probably not too far from where you are. Now I live in a little town in southwest Wisconsin. It's really beautiful here and I love it. Thanks for the weekend wishes. We're having perfect weather and I'm on my way out to the garden. Hi, Tammy. Must be a challenge keeping everything alive during the summer in the desert. I can't even imagine. It's hard enough sometimes here to keep on top of the watering, though we've been lucky this year and had a good amount of rain. Purple basil is lovely! Mine usually doesn't get a chance to go to flower, though, as I'm always eating it or cutting it to make pesto or freeze. Definitely look for the little seedpods. They'll open up on their own or you can pop off the little cap and spread the seeds yourself. I have such a fondness for wild gardens, too. Here's to the wild and wonderful! I wish mine would have self-seeded. They didn't survive the winter, oddly enough and I would have enjoyed some babies. I planted more, so perhaps these will be fruitful and multiply! Thank you, Simone. Portulaca are so easy to grow and really hardy despite looking so delicate. See if you can find some seeds for your garden. It's been hot here, too, but we have gotten rain. Mostly in big storms. I have had to water a lot, especially my seedlings. Hooray for hibiscus! I bet they'll be beautiful when they bloom! I hope you're enjoying the summer in spite of the heat! I feel bad pulling them too.